Hi to All Members - So far it has been a good year. We are now planning our first "real" fund raiser, the Soup Night on November 2. It has been talked about at our previous meetings and you will hear more about it again at the October meeting. Come ready to buy your tickets! We need all hands on board to make this a great event. Maria Brugger is the chairperson with a committee of many to help but we need to sell a lot of tickets. She will share more about this event at the meeting. So please listen and offer help and commit to buying tickets. Ken and Lynn Steen were the greeters for our July meeting. The Nominating Committee will announce the officers for next year at the meeting. You can also make nominations from the floor before the election. I feel that those nominated by the committee are up for the jobs for which they have been nominated. Warren introduced everyone individually, and as ex-postal employee, reminded them of their address. How do you do that, Warren? 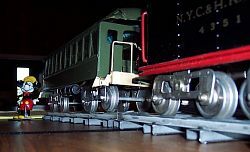 One of Pete White's model trains that decorated the tables for this meeting. Reminder on dues: FOHS dues were supposed to go up a little last January, but since issues with the bylaws held up their passing we decided to put it off until this coming January. The new dues are shown on the last page of this newsletter. Program: Come and be enlightened.... a mystery! Those of you who were present at July’s meeting enjoyed the presentation on the “New Projects for the Website” from Jim Pearce, our website coordinator. 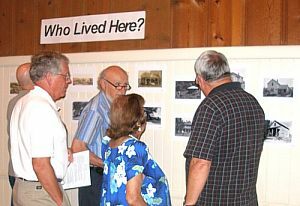 The topics included in the presentation were: Fair Oaks Books, Historical Maps of Fair Oaks and Old Homes of Fair Oaks. The presentation included a slide show explaining how to access the FOHS website and demonstrating the Fair Oaks books, maps, and homes on our website. Without Jim’s hard work and dedication, the FOHS would not be making the big step into the 21st. century and be able to share our history across the country at a touch of a few keys. The FOHS is very lucky to have someone as dedicated and knowledgeable as Jim Pearce to support and design our website. I would like to take this opportunity to thank Jim for all his work and the great presentation. 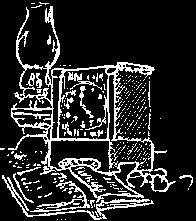 This month please take a few minutes and log on to the Fair Oaks Historical Society’s website at www.fairoakshistory.org as there is much to learn about our fair community. Jim explains some new features on the website. Ken, Tel, June and Jim look at photos of some of the unidentified old Fair Oaks homes. January 2008’s potpourri program will be on "My Favorite Toy." If you have a story to tell please contact me and I will put you on the January program. If you have an idea or suggestion for a future program topic please let me know. I want to bring historical topics of interest to all of you. You can call me at (916) 944-4812 or e-mail me at sherrywood1949@yahoo.com. On September 9 Bill Hinsey donated to the History Center his bat boy uniform from Kellams Hardware Store. Kellams was the sponsor of this semi-pro baseball team. Home games were played at Bannister Park in the middle 1940. Billy also gave us printed programs from a football and basketball game at San Juan High School. 1930-1940. Thank you Billy. The Fair Oaks Chicken Festival was held on September 15. 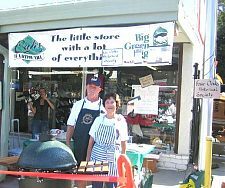 The Historical Society competed in the 2007 B-B-Q Cook-Off in the amateur division. We were awarded 3rd place. A very nice trophy is now standing on the fireplace mantel at the History Center. Thank you Pete and Nancy White. Pete and Nancy serve up their award winning B-B-Q'd chicken at the Fair Oaks Chicken Festival. 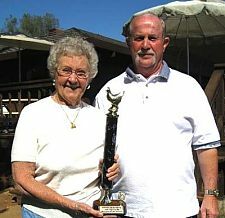 Lois and Pete show off the third place trophy. 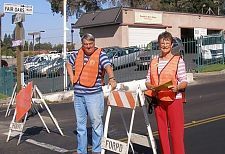 Not as glamorous a duty, but Jim and Marilyn take a shift at the barricades welcoming visitors to the festival. 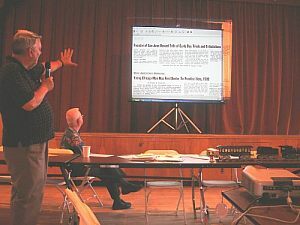 I enjoyed making a presentation on new sections on the Fair Oaks Historical Society website at the July meeting. I was barely able to complete an overview of the new items , so I hope you'll have time to take a look at the detail. For those of you who missed the meeting, we now have three Fair Oaks historical books on the website, a Fair Oaks History Through Maps section, and photos of old Fair Oaks homes. Another research source which gets a lot of use are the U.S. Census pages for Fair Oaks. Since I subcribe to a genealogy service which makes those pages available on-line, I was able to collect the content for the 1910 census of Fair Oaks and put that information on our website. When I have time, I'll work on some of the other census years. The technology group, as we did the inventory of the museum, took notes on projects that would make our historical items more available. 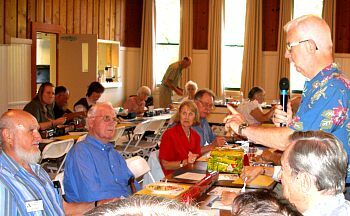 At the October meeting, we'll be asking for volunteers to help with computer entry, sorting and consolidating photos, indexing, scanning and other tasks. If you're not going to be at the meeting and want to help out for an hour or so, please call or e-mail any of the technology group. As always; comments, corrections and suggestions are welcome to any of the FOHS Technology Group (Joe Dobrowolski, Jim Pearce, Ken Steen and Sherry Wood). The Soup Night committee has been hard at work getting things ready for our first annual Soup Night on November 2nd. The menu consists of four delicious soups, salad, a variety of artisan breads, coffee, juice and cookies. There will be wine available (please no outside wines). All proceeds from this event will go towards securing a permanent home for our History Center. We are currently “borrowing” the Fireside Room from the Recreation and Parks District, but it’s crowded and a number of our wonderful artifacts and memorabilia can’t be displayed. It is our hope we will be able to secure the old Fair Oaks Library building as our permanent History Center. The style and period the building was built is a perfect match for the reason we exist – preserving the heritage of Fair Oaks. Your support is needed! Buy your tickets as soon as possible to do your part. Don’t wait for the October meeting, order your tickets today. 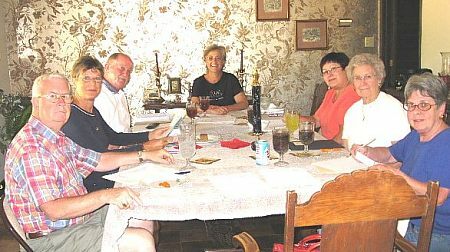 Committee members pictured above at our September 17 meeting in the Brugger home (L to R): Warren, Marilyn, Pete, Chair Maria, Trudy Vasquez, Lois and RoseAnne. Janet took the pic. and Sherry Lynn was on the phone. Others absent or delayed include Ken and Lynn, Claudia, Sue B., Charley, Bobbie, Dianna and Lillian. who lives at 4044 Central Avenue. 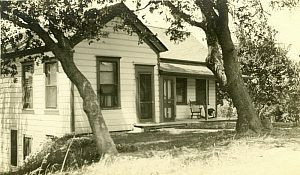 Tempe came to live in the house on Smallwood Lane at the age of 2 in 1928 with her father, William C. Smallwood, her mother, Eunice, her sister and brother. Her father worked the gold dredges and died the following year. Her mother bought the house, including 3 lots, for $1500. She paid the bill for water taxes that the Greens had left and finished paying for the properties in 1941. She was a hard worker in hard times who took in boarders, cleaned homes for a $1.00 a day and worked at the olive plant. She later married Mr. Phipps and lived there until her passing in 1973. Tempe lived in the house until she married at age 19 to an Air Force soldier who died stateside. She returned to the family home at age 22 with a child and has lived on the property since. Her current home which she shares with her daughter, Sandy, was built over time on Central. The three structures on Smallwood remain rentals. 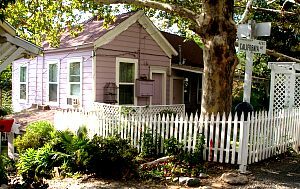 The Smallwood house was built of redwood and while seeming "old" during her growing up, it was sturdy and "never had a termite." 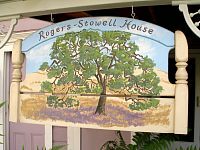 It got the name "Rogers-Stowell House" for the handyman who helped with cosmetic and other repairs and for Sandy's grandmother's maiden name, Stowell. The house has two levels that include a front room, kitchen and pantry, 2 bedrooms and a bathroom on top with 4 rooms downstairs and l bathroom. There is a "small" blue house nearby that was said to house some local Chinese servants who shared a bathroom with the 2 rentals underneath the main floor. Tempe inherited the properties and her daughters assist with the management. Having lived in Fair Oaks, she remembers the very rural feeling of homes spaced a distance from one another, dirt roads and how the community all knew one another. Her brother, W.C. Smallwood, died in WWII and the lane was named in honor of him.